Distributed sensing systems for studying scientific phenomena are critical applications of information technologies. By embedding computational intelligence in the environment of study, sensing systems allow researchers to study phenomena at spatial and temporal scales that were previously impossible to achieve. We present an ethnographic study of field research practices among researchers in the Center for Embedded Networked Sensing (CENS), a National Science Foundation Science & Technology Center devoted to developing wireless sensing systems for scientific and social applications. Using the concepts of boundary objects and trading zones, we trace the processes of collaborative research around sensor technology development and adoption within CENS. Over the 10-year lifespan of CENS, sensor technologies, sensor data, field research methods, and statistical expertise each emerged as boundary objects that were understood differently by the science and technology partners. We illustrate how sensing technologies were incompatible with field-based environmental research until researchers “unearthed” their infrastructures, explicitly reintroducing human skill and expertise into the data collection process and developing new collaborative languages that emphasized building dynamic sensing systems that addressed human needs. In collaborating around a dynamic sensing model, the sensing systems became embedded not in the environment of study, but in the practices of the scientists. Distributed sensing systems are exemplar technologies for advancing science (Atkins et al. 2003; Estrin et al. 2003; Cyberinfrastructure Vision for 21st Century Discovery 2007; Harnessing the Power of Digital Data for Science and Society 2009). Sensor networks, for example, can monitor environmental phenomena by facilitating the collection of higher volumes, densities, and qualities of data than were previously possible in environmental studies, and by allowing scientists to interact with those data shortly after they are collected. In this paper, we document one setting, the Center for Embedded Networked Sensing (CENS), in which such sensing systems were developed, tested, and deployed. CENS, founded in 2002, is a National Science Foundation Science & Technology Center devoted to developing sensing systems for scientific and social applications through collaborations between engineers, computer scientists, and domain scientists. In field-based sciences, collaborations between scientists and technology researchers take both groups out of their comfort zone: technologists must test new equipment in highly unpredictable field settings, and scientists must rely on technologists to ensure that field excursions are successful. 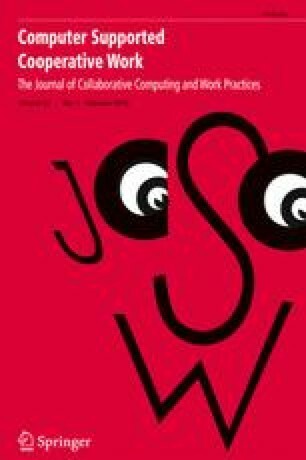 Coordinating technology development and scientific research is a growing theme of Computer Supported Cooperative Work (CSCW) studies, with many open questions (Lawrence 2006; Spencer et al. 2011). Our work within CENS illustrates the intersection between technology developers’ desire to build ubiquitous systems and scientists’ needs for technologies that are adaptable to particular field settings. In the first few years of CENS, the focus was on developing smart dust technologies. “Smart dust” refers to intelligent static sensors that can be deployed by the hundreds or even thousands (Embedded Everywhere 2001; Warneke et al. 2001). Smart dust sensors, as originally envisioned, would be scattered around the field site, with the sensor devices themselves blending unobtrusively into the background. The goal of smart dust systems was for the sensor and network to do all of the work – the sensing, the reasoning, and the adapting – without the presence or assistance of human researchers. Static smart dust remains the most common conception of sensors used in environmental research in the popular press (see for example, Lohr 2010). Within CENS, however, the vision for environmental sensing systems changed dramatically from smart dust-like systems to systems that emphasized mobility, flexibility, and human participation in the sensing process. Why did such a change in direction occur? In this paper, we trace how this shift involved a confluence of topics important to science studies: the challenges of infrastructure development, the difficulties of interdisciplinary collaboration, and the situated nature of research practices. We look at the processes of infrastructure development and adoption in relation to the ways that these technologies were envisioned. By examining background narratives that accompanied the development of environmental sensing infrastructures over the course of CENS’ lifetime, we illustrate how sensing technologies were incompatible with field-based environmental research until researchers unearthed their infrastructures to make human needs, requirements, and expertise as central to their collaborations as technical needs, requirements, and capabilities. Through the active process of changing research methods, bringing in new expertise, and developing new language, the focus of CENS research shifted from “static” sensing systems, which were installed in a single location for long periods of time, to “dynamic” sensing systems that environmental scientists could install quickly and move to multiple locations easily. CENS’ dynamic sensing systems emphasized mobility, flexibility, and human-machine interaction. Toward these goals, CENS researchers developed sensor technologies, research methods, and collaborative languages that were more appropriate for the scientists’ field research needs, and more appropriate for the technologists’ rapid prototyping development processes than were static smart dust-like sensing systems. CENS is a distributed research center (Bos et al. 2007) based at UCLA with four partnering institutions in central and southern California. CENS was founded in 2002 by the National Science Foundation for an initial 5 years, and received renewal funding from the NSF in 2007 for an additional 5 years. CENS is closing officially in 2012 as its NSF funding ends. The Center was granted a No Cost Time Extension to finish closing out activities in 2013. Over 300 faculty members, students, and research staff from numerous disciplines have been associated with CENS. Personnel changes occurred as new projects were initiated, students graduated, faculty and staff moved to new positions, and as funding ended for particular projects. Technological researchers within CENS included computer scientists, electrical engineers, and mechanical engineers, while application scientists included seismologists, terrestrial ecologists, environmental engineers, and aquatic biologists. Other members of CENS came from urban planning, design and media arts, and information studies. This interdisciplinary setting is a central feature of CENS. Our study population includes members of multiple disciplines (scientists and engineering researchers of multiple kinds) who were situated in multiple institutional settings (CENS and their home universities). Research projects within CENS typically consisted of groups of five to fifteen researchers who collaborated around the development of particular sensing systems. CENS supported many independent projects at any one time, although some people, equipment, and practices were shared between projects. Our focus was on projects in which sensing systems were tested and deployed in real-world field settings for use by scientists in the four CENS scientific application domains: seismology, terrestrial ecology, environmental engineering, and aquatic biology. As disparate as CENS projects were, in our inquiry they were unified by their application of novel technologies to field-based research. The CENS seismic team provided the initial prototype for the ways that sensing technologies should be used in field settings. Initial CENS sensor deployments in other science domains were modeled on seismological sensing approaches. We use the term “field-based sciences” for the duration of the paper to refer to this assemblage of research domains encompassed by CENS’ research activities. While field-based sciences, whether physical, environmental, or biological sciences, have not received as much attention as laboratory sciences in ethnographic accounts of scientific infrastructure development (Dennis 2003), a substantial literature does exist on field practices. In the following section, we emphasize common features of field-based research practices, while noting where differences have been identified. Our study draws on concepts from scientific work, technology development, and human collaboration. In analyzing CENS’ research, we focus on three central concepts and the interactions between them. First is infrastructure, including how infrastructures are developed, used, and studied. Next are boundary objects and trading zones, which arise in the context of interdisciplinary collaboration. These three concepts feature strongly in our narrative of CENS’ activities, and are particularly useful in combination, as they interact in rich and important ways. We start with a discussion of infrastructures. Infrastructure development is a well-researched topic in science studies. Star and Ruhleder (1996) outline eight dimensions of infrastructure: it is embedded in “other structures, social arrangements and technologies,” it is transparent to use, in that it “invisibly supports …tasks,” it has a spatial or temporal reach or scope “beyond a single event or one-site practice,” it is learned as part of membership in a community of practice, it has links with conventions of practice in that infrastructure “both shapes and is shaped by the conventions of a community of practice,” it embodies standards by “plugging into other infrastructures and tools in a standardized fashion,” it is built on an installed base and “inherits strengths and limitations from that base,” and finally, infrastructure becomes visible upon breakdown (pg. 113). Bowker (1994) outlines a methodological move called “infrastructural inversion” for studying infrastructure development. “Take a claim that has been made by advocates of a particular piece of science/technology, then look at the infrastructural changes that preceded or accompanied the effects claimed and see if they are sufficient to explain those effects – then ask how the initial claim came a posteriori to be seen as reasonable” (pg. 235). For sensing technologies to have the promised influence on field-based sciences, significant infrastructure development is required. These expectations include data collection capabilities that are tightly coupled with the physical world, autonomously configurable, and capable of reaching much wider geographic scales and more granular time intervals (Embedded Everywhere 2001). Large-scale technological infrastructure traditionally has not been a widespread feature of field-based sciences, with the exception of seismology, where sensors have long been standard seismic data collection tools (Havskov and Alguacil 2004). Infrastructures for seismological sensing are well established on a global scale, having been a focus of Cold War scientific investment (Barth 2003). Environmental, ecological, or biological field studies, on the other hand, typically have consisted of isolated individuals or small teams of scientists investigating small-scale phenomena in particular field settings (Michener 2000; Michener and Waide 2008). Researchers are acculturated to perform individual field experiments in challenging environments (Roth and Bowen 2001a; b) and to share stories about their fieldwork in informal settings as a way to become part of the community (Bowen and Roth 2002). Much of the research in environmental, ecological, or biological field studies has focused on characterizing specific environments or ecological phenomena through traditional manual data collection methods, such as taking physical samples, counting observations, and hand measuring specimens and physical features, and their associated laboratory analysis techniques, such as DNA synthesis, bacterial cultures, and chemical analysis of physical samples. Large-scale studies in the environmental, ecological, and biological fields have taken place in the past 50+ years, but have not had goals of developing technological infrastructure. For example, biological research was a small part of the International Geophysical Year initiative that took place in 1957–58, and was at the center of the subsequent International Biological Program (IBP) that took place from 1964 to 74 (Aronova et al. 2010). Similarly, the Oak Ridge National Laboratory employed more than 200 researchers in the ecology/environmental sciences by 1976 (Bocking 1997). Contemporary organizations, including the Long-Term Ecological Research program (LTER) and the National Center for Ecological Analysis and Synthesis (NCEAS), also support cross-cutting and integrative ecological research. The LTER program was established by the National Science Foundation in 1980 to promote field-based study of ecological patterns and processes over longer time frames than had traditional studies (Karasti and Baker 2008; Michener and Waide 2008; Aronova et al. 2010). NCEAS, on the other hand, facilitates new analyses of existing environmental and ecological data by bringing together under one roof researchers with diverse kinds of expertise that cut across the smaller environmental studies (Hackett et al. 2008). One of the goals of the nascent National Ecological Observatory Network (NEON) is to establish technological infrastructure. NEON is a National Science Foundation initiative to create a nationwide network of environmental observatories dedicated to the study of ecological phenomena that occur over continental geographic scales and decades of time (Hopkin 2006). CENS was seen as an initial test bed for sensing systems that might later become part of NEON’s observatory infrastructure, thus a number of CENS investigators sat on NEON advisory boards as NEON was being planned. NEON will establish a number of ecological observatories across the United States, with each station having advanced sensing technologies as an integral component. The network began constructing observatories in 2012 (NEON 2012). How infrastructure is imagined plays an important role in how it is developed (Mackenzie 2003). The goal of sensing system development for field-based sciences is to allow researchers to move beyond traditional field methods. By embedding computational intelligence in the environment being studied, sensing systems enable field-based scientists to study phenomena at spatial and temporal scales that were previously impossible to achieve (Arzberger 2004; Estrin et al. 2003). Having computational intelligence in the field allows researchers to perform time synchronization, in situ calibration and data validation, and programmable tasking, among other features (Porter et al. 2005). Such systems, however, can be developed only through collaborations between field-based scientists and technical experts. Networked sensing technologies thus come to field-based sciences hand-in-hand with the introduction of big science characteristics: larger teams, larger and more expensive equipment, distributed collaborations and coalition building (Galison and Hevly 1992). Two important concepts that featured in our study of CENS were boundary objects and trading zones. Interdisciplinary collaboration requires spaces in which common practices and languages can be created. Boundary objects, which are at the center of collaborative work spaces, are “objects which are both plastic enough to adapt to local needs and the constraints of the several parties employing them, yet robust enough to maintain a common identity across sites” (Star and Griesemer 1989, pg. 393). Star (2010) notes that boundary objects have three aspects: 1) interpretive flexibility – the “same” objects are used and interpreted differently by different people or groups, 2) material/organizational structures that “allow different groups to work together without consensus,” and 3) scale and scope that make visible the individual and collective “information and work requirements” of the collaborating groups (pg. 602). Boundary objects enable tasks to be negotiated and work processes to be aligned and standardized (Lee 2007; Pennington 2010). The collaborative spaces in which boundary objects exist can be characterized by Galison’s concept of a trading zone. A trading zone is a space in which problematic collaborations still manage to collaborate. As Galison (1997) describes, a trading zone is “an intermediate domain in which procedures could be coordinated locally even where broader meanings clashed” (pg. 46). In trading zones, collaborators develop jargons, and pidgin and creole languages relating to work practices. Trading zones may manifest as clumps or clusters of collaborators that come together intermittently: “in the trading zone, where two webs meet, there are knots, local and dense sets of quasi-rigid connections that can be identified with partially autonomous clusters of actions and beliefs” (pg. 816). As collaborations solidify, however, the pidgins and creoles that develop can be highly homogeneous within a particular type of research. Collins et al. (2007) expand Galison’s concept into a general model with four types of trading zones. In their model, Galison’s trading zone is an “inter-language trading zone,” in which the creation of the pidgins and creoles are the central organizing feature, and collaboration and homogeneity are high. The three other types of trading zones are enforced, subversive, and fractionated. Enforced trading zones, as the name suggests, are spaces in which collaboration is brought about by coercion, little sharing of culture takes place, and the benefit of the interaction is entirely one-sided, such as if research funding is withheld or withdrawn entirely due to a (real or perceived) lack of effective collaboration. Subversive trading zones are zones in which two (or multiple) languages or practices are replaced by a single language that initially belonged to only one of the groups involved, such as how Einsteinian physics achieved cultural hegemony over Newtonian physics. Fractionated zones exist around “interactional expertise,” which refers to ways in which collaborators internalize “the tacit components of [the] strange language” of their counterparts (Collins et al. 2007, pg. 661). Collaborators may understand their counterparts’ languages and practices enough to benefit from them, but not enough to claim them as their own. Interactional expertise is having enough expertise in a collaborator’s language and practices to interact in a productive way. Collins, Evans, and Gorman discuss how zones might evolve over the course of a collaborative process. They illustrate how collaborations might exhibit certain trajectories, moving from one kind of trading zone to another, for example from boundary objects and interaction expertise to Galison’s inter-languages, or to hegemonic or enforced trading zones. Trading zones might evolve for a number of reasons. As already noted, collaborative languages might evolve with the development of boundary objects, which might be new technologies or infrastructures. In addition, the characteristics of the research sites themselves might impact how trading zones evolve. In the case of CENS, research commonly took place in field settings, which are often highly idiosyncratic. The characteristics of field settings add complexity to the process of introducing new technologies or infrastructures into field-based science research, which itself is notoriously challenging. Real-world settings present unpredictable weather, unexpected flora and fauna, and resource limitations, plus the inherently uncontrollable nature of field sites. Ecologists, whose field research practices are the most studied, have developed standard field methods that make experiments more replicable. They deliberately choose research locations that are as close to ‘lab-like’ as possible to minimize natural variation and to take advantage of the characteristics of unique sites (Kohler 2002a). Ecological field methods may include the use of “quadrats” – staking out square plots and counting the number of plants or animals found therein (Kohler 2002b; Roth and Bowen 2001a) – and standard data collection protocols and forms (see Andersen et al. 2002 and Heidorn et al. 2002 for examples). The diversity of variables and data types in ecological studies can, however, undermine even the best methods plan (Bowker 2000). Field-based research activities can be characterized in Suchman’s (1987) terms as situated actions. Situated actions depend “in essential ways upon … material and social circumstances” (pg. 50), and are “tied…not to individual predispositions or conventional rules but to local interactions contingent on the actor’s particular circumstances” (pg. 28). In the field, researchers react to unexpected events according to their own experiences and the particulars of the situation. Introducing advanced technology into field settings does not change the situated nature of ecological and environmental science research. Szlavecz et al. (2006) describe the difficulties encountered in developing a set of end-to-end data services for scientists using sensors to study soil ecology in a particular location, including the need to decide where to place sensors and data communication equipment once on location, the necessity of programming sensors both before and after they are embedded in the ground, and the need to calibrate and re-calibrate sensors as the deployment proceeds. Field research requires creative solutions to unexpected problems that arise in the field (Roth and Bowen 2001a). Often this requires creating new tools or adapting existing laboratory tools to new purposes and settings (Bowen and Roth 2007; Kohler 2002a). Nutch (1996) notes that individuals who are particularly adept at improvising and tinkering with tools, whom he refers to as “gadget-scientists,” are highly sought for their ability to overcome obstacles. In collaborations where engineers do much of the technical work, the responsibility for providing in situ improvisation of research tools may shift to the technical staff, particularly in situations where there are no “gadget-scientists” available. This can cause tensions due to the different understandings of technological needs between the scientific and technical researchers (Finholt and Birnholtz 2006). In the next sections, we present our ethnographic studies of infrastructure development, collaboration, and field practices within CENS. After outlining our research methods, we present a narrative of CENS sensing system development. Our research encompasses ethnographic observation of CENS sensing system deployments and interviews with members of CENS. In addition, the authors of this paper were members of CENS for 5, 8, and 10 years respectively, during which time we had regular interaction with CENS researchers during formal gatherings, such as research reviews and retreats, weekly research seminars, and informal gatherings and discussions in labs and offices. This extended timescale in which we have participated in CENS allows us to develop biographies of the technologies and research methods developed therein (Pollock and Williams 2010). To frame the following discussion, we present sensing system deployments as research activities in which sensors, sensor delivery platforms, and/or wireless communication systems are taken out into field settings and used to study phenomena of scientific interest. CENS deployments have taken place in numerous locations around the world, including Bangladesh, Central and South America, and southern California lakes, streams, and mountains. Two members of our research team studied more than 20 CENS real-world sensor deployments as participant observers, both observing and taking part in deployment activities, encompassing approximately 300 hours of participant observation over 4 years. Participant observational methods allow investigators to build social scientific understandings of human actions in their natural settings (Lofland et al. 2006). The observed deployments span six CENS projects, including beach contaminant monitoring, marine biology, soil ecology, seismology, river monitoring, and engineering field tests. The number of CENS researchers participating in the deployments ranged from two to ten. The length of our participant observation ranged from single day excursions to a three-week stay with CENS researchers at a remote field site. Ethnographic field notes and digital photographs were taken that focused on the nature of deployments, field-based scientific research practices, and the role of information systems in heavily instrumented field-based research. During these deployments we participated in equipment installation tasks, data collection, and numerous other field activities. Our participant observations have been supplemented by informal interviews and discussions before, during, and after deployments with CENS researchers regarding their data collection and collaboration practices. Our study followed the grounded theory methodology (Glaser and Strauss 1967). Our intensive interviews with CENS researchers were collected in two groups: 22 participants in 2006 (with two additional pilot interviews in 2005) and 14 participants in 2010–2011. Interviews ranged from 30 min to 2 hours in length, averaging roughly 45–60 min. The interviews were audiotaped, transcribed, and complemented by the interviewers’ memos on topics and themes. The particular topics of field notes, interviews, and supplementary document collection were continually adjusted and updated during the course of the study through theoretical sampling of emerging themes and issues that arose. Theoretical sampling – that is, using the process of jointly collecting, coding, and analyzing data to decide what data to collect next and where to find them – allowed us to develop theoretical considerations as they emerged (Glaser and Strauss 1967; Clarke 2005). Analysis proceeded by identifying emergent themes throughout our observation and interviewing processes, and testing those themes iteratively as the corpus of interview transcripts and notes grew. We developed a full coding process for each round of interviews; these codes were used to test and refine themes in coding of subsequent interviews. With each refinement, the remaining corpus was searched for confirming or contradictory evidence. Interview passages provided in the next section note when the interview took place and a brief descriptor of the interviewee, such as “faculty ecologist.” Any names given in interview passages are pseudonyms. The name of CENS itself, the Center for Embedded Networked Sensing, implies an emphasis on sensing technologies that become an integral part of the system being studied. The smart dust vision motivated the creation of CENS and much of the early technology development. We trace how this emphasis on smart dust technologies gave way to more nuanced understandings of the role that sensor technologies play in scientific research through building a narrative of CENS’ research timeline. The researchers assembled as part of the CENS proposal spanned multiple types of engineering, computer science, seismology, biology, ecology, environmental science, education, and information studies. Breakthroughs in VLSI digital signal processing, ultra-miniature sensors, low-power micro-controllers, global positioning systems, and wireless digital networks will make it practical to develop cheap and nearly ubiquitous ground-based monitoring systems for outdoor field use. (CENS 2002, pg. 11). What the [CENS technology] really enables us to do is to get really high resolution spatial and temporal sampling… What a biologist would do if he were interested in stream water quality, he would go like this. [bucket drop hand motion] And then you analyze that sample. …characterizing and understanding what kind of variability they’re dealing with over a 24-hour period spatially or temporally is really not considered. So that’s kind of the big advantage of doing the [CENS] method. Thus, much as the CENS collaboration was encouraged by the NSF’s STC program, which provided an institutional funding base, interdisciplinary collaboration was promoted through the development of a scientific and technological vision that promised mutual benefit for all of those involved. Large-scale infrastructural goals are also clear in the proposal, as evidenced by statements such as, “these systems will emerge as the largest distributed systems ever deployed” (CENS 2002, pg. 3). In these initial conceptions of CENS, human components of sensor infrastructures are not explicitly addressed. The salient boundary objects were ubiquitous smart dust-like sensors, and the initial communicative trading zone centered around a vocabulary that described high-density sensor networks being embedded in urban and rural setting with little human input. That’s one thing that we definitely learned, just like working across different fields. We learn that we have different vocabulary and when I say sensor fault, that means something different than maybe when she says it. And so the first couple of years was spent developing the tools and that took a fair amount of time just so we could collect the measurements. Then we had problems with the sensors we were using. They were off-the-shelf sensors, but it turns out they didn’t do what they were supposed to do and they were really not appropriate for us, in spite of the fact that they cost a lot of money. One member of CENS quipped at an annual research retreat in 2006, “about 90 % of the papers produced in the first 3 years of CENS were about battery life.” Similarly, a seismologist recounted how most of the CENS research seminars he attended at the beginning of CENS’ existence seemed to be about theoretical computer science. He remarked how at the beginning of CENS the seismologists had trouble figuring out how to work with computer scientists because the developments that the seismologists needed were not considered to be interesting computer science work. Technologies were thus boundary objects in the sense that to the scientists, the technologies were tools that were yet to be usable for their intended purpose, while for technology developers, the technologies were themselves the purpose of the research. Thus the technologies were interpreted differently across collaborations, while still allowing the groups to work together. As the following quote from a technician notes, the precise details of the technology were not important to the scientists. The biologist doesn’t care how I build things that much. He just wants an instrument that he puts out in the water and it does certain things and collects the data he wants. And he doesn’t care what model battery I put in it or how I wire it, or how many fuses or whatever. He just wants an instrument that works. This quote illustrates how technicians had freedom in developing creative and innovative solutions to technical problems within the functional constraints that scientists provided. These constraints, in addition to guiding the direction of the developmental technology, enabled CENS to sit in a distinctive position within the academic engineering and computer science networks dedicated to sensor and networking research, namely the position of having immediate and urgent feedback on the success of their systems. We think we have one thing that distinguishes us from [robotocists outside of CENS], which is that we are teamed with people who actually care about the measurements that are being made. And so in some sense those constraints matter to us. We can’t go out and do absolutely anything we want just because it’s interesting from a robotics point of view, and I think that’s a good thing from my point of view. It makes the problem real for me, because at every stage the measurements we make have some real meaning to the people doing the biology. As laboratory-tested equipment began being deployed in real-world field settings, the resulting sensor data became boundary objects of their own. Only the data that were relevant to scientists, however, became boundary objects. Other types of data remained local to each science and technology team, and did not become points of contention in the collaborations. So I just thought of a whole other category of information that’s being produced by this project, and that’s the technological debugging stuff, which is going to feed back to CENS in particular, back and forth, the technology of relaying information, the sensor technology. We already have problems with some of the sensors and trying to figure out what’s going on there. I mean, that’s almost as important in the present project as the ecological interpretations. But I realize even I think of it as completely separate, like two compartmentalized kinds of data information. But there are going to be consequences from one to the other, right? The scientifically useful data were used in different ways by the collaborators. As a consequence, the data traced the information and work requirements of the collaboration. The following quote from a faculty biologist illustrates 1) the division of labor between faculty and graduate students in regards to field work, 2) how the scientific and technical PI’s on a project were considered to have equal ownership of data that resulted from the collaboration, and 3) how data sharing facilitated collaborations with outside partners. I mean, [the engineering PI] and I ostensibly are the head of this [research] group, but we have six or seven people who are physically collecting the data. Let’s face it, [the engineering PI] and I are not out there in the field every single day. But certainly we would be the authors of that data set. And we have done this. [The engineering PI] has said, hey [another CENS engineer] wants to see such and such in the data set. You haven’t got a problem with that? I go, ‘no.’ But obviously he has the courtesy to ask me because if there is something that I feel is proprietary then he would probably hesitate or try and talk me into it or something. Personally I’ve very open about these sorts of things. CENS’ boundary objects – sensing technologies and their data – reflect opposing trends in the CENS collaborative processes. The sensing technologies served as boundary objects in the push towards ubiquitous embedded sensors, while the data served as boundary objects that illustrated how the science and technology researchers were not receiving equal benefits from the collaborations. The process of organizing collaborations around sensor technologies and their resulting data in ways that are conducive to multiple disciplines began to highlight the drawbacks of smart dust-like sensing systems. CENS researchers developed conventions of practice in working with each other and with sensor technologies and data. As these conventions matured, collaborators developed enough knowledge about their counterparts’ practices and language to work together. Neither side gained full grasp of their counterparts’ professional worlds in the material, social, or cultural sense. [T]he challenge with a lot of this technology is the communication with the engineers. And [the staff ecologist] is a godsend because he’s over there [with the engineers] all the time, so we’re constantly talking. So the first couple years when I didn’t have him I would sit down with the engineers and talk about something and then I wouldn’t talk to them for 2 or 3 weeks. And instead of going this direction they would somehow go off in this [other] direction, which might have been a fascinating engineering question but it didn’t do me any good at all, so some of the early light work they got off on real tangents that had no ecological significance. The role of the CENS’ staff ecologist was to be the first tester and provider of feedback for new ecological sensing systems. In the process, however, he also began developing technical tools of his own, including new ways of sensing the magnitude of ambient light and the use of cell phones as sensors. In other collaborations, technical researchers provided interactional expertise. In a CENS environmental science project, the science and engineering teams worked together to develop a robotic sensing system for studying environmental contamination. The robotic system, due to the complexity of the interface and the fact that it was continuously under development, was initially usable only with a member of the technical team present to run the system. About a year into the collaboration, after the team had done a couple of joint science and technology field tests, one of the engineering students transferred into the department of the science team. At that point, the science team had enough internal interactional expertise that they were able to conduct their own field tests and experiments using the system. In a similar example, a member of the seismology team’s technical staff moved into a scientific role by enrolling in a partner seismology Ph.D. program after 3 years in a technical role. In about 2005, the third year of CENS, a statistician joined the Center as a collaborator. The statistician and his students played important bridging roles by developing methods to make better use of the data being produced by the sensor networks. Statistics is a common research tool among scientists, computer scientists, and engineers, but the types and sophistication of statistical methods utilized by the different collaborators were uneven, and often not directly applicable to the new kinds of data. As such, statistical methods were themselves a boundary object within CENS. As the lead statistician noted, part of his desire was to bring multiple viewpoints together. There’s a whole story that goes into how I would like to see engineers trained and also statisticians trained so they know a bit more on what goes on in each other’s back yards or front yards for that matter. I find [the engineers] getting into problems of calibration, which are sort of classic statistical problems. I find them getting into problems of experimental design, again classical statistical problems. The statisticians’ roles in facilitating a linguistic trading zone included bringing the scientists closer to the technical viewpoint. In the following quote, the lead ecologist notes how the statistician brought new language for what they might be trying to develop. But I think the idea, and this is really [the lead statistician’s] input and not so much mine, is what is the toolbox that people use. So I think the big question that permeates a lot of these kinds of issues when you get to the biological observatory with a lot of sensors is that … there’s a ton of data coming out and what do you do with it? How do you find out if it’s bad data, how do you know to change the batteries? And then the other issue [the lead statistician] harps on a lot is that a lot of the things we’re interested in aren’t direct measurements. They’re calculations. Even with the interactional expertise of these bridging individuals, collaborative problems still occurred. In particular, the tension between the scientists’ needs for robust field-ready sensing systems and the technologists’ desire to develop new systems led to collaborative problems. Well CENS has changed. It started out in the beginning being all about building things. And then it became clear that, no, we’re really all about research. You know, if we can research something to kind of measure something in a new way and get close, then that’s research. And you can end at that. You can end before you actually have a system that you could turn around and run now for weeks or months on end. Or that you could take it to a new location and run the same experiment. There’s much less interest in moving it to that full-time, deployed, continuously-measuring application. …[For example, two sensor systems we use] break fairly quickly and they’re way too heavy and they have issues with long-term operation. And the last two times they’ve taken them down and put them back up, they’ve broken immediately. And then there’s no follow-through because [the engineering] team is primarily students and they are on student schedules and such. Weatherproofing is something that has no meaning to my students in terms of publications and so forth. You know, if you’re a company selling products, that’s one thing. But we’re not in that business. On the other hand, for [scientists] to be able to really use these things realistically… our equipment cannot just be nice and sunny weather equipment. It has to work in a more realistic environment. This tension between the needs of scientific and technical research is fundamental to the longitudinal course of CENS’ technology development and collaboration. Certain individuals often played bridging roles, bringing interactional expertise to both sides of a collaboration. This interactional expertise enabled the collaborators’ different needs and requirements to become more visible. Conventions of practice were necessary that allowed scientists, engineers, and computer scientists to pursue their own desired research questions, while working together around shared tools and data. Following the model provided by seismology, long-term deployments of static sensors were envisioned as the primary method of sensor deployment within CENS. The static sensor deployment method became problematic, however, as it proved to have limited utility for most of the other scientific teams. Deployment methods thus emerged as a boundary object within CENS. Different deployment methods configured human expertise and technology capabilities in different ways, and adjusting these configurations became central to the organization of CENS collaborations. On static sensor deployments, sensors were installed and left in place for an extended period of time. The seismic team was the first science group in CENS to undertake a large-scale sensor deployment. CENS’ innovation for seismic sensing was the use of novel wireless communication algorithms and data routing schemes to facilitate more efficient data transmission from remote installations to a central database. The seismic sensor systems collected data autonomously, logging data to a storage card and then sending the data to CENS servers on an hourly-to-daily basis over a CENS-built wireless radio network and the internet. The seismology team left the sensors in their initial installation locations for about 2 years before moving them to a new location or removing them completely. Figure 1 shows a CENS seismic sensor installation. The installation includes a sensor (covered by the round white plastic tube on the left), and a suite of power and electronic hardware components (shown in the large metal box on the right). As with any field deployment, the CENS seismology deployments ran into a number of unpredictable problems, including difficulty establishing line-of-site wireless links, faulty wireless and data storage cards, broken antenna cables, unreliable power sources, sensor calibration issues, lightening strikes, vandalism, and theft. Even with such problems, the CENS seismic sensor deployments provided an example of what a successful static sensor deployment could look like for the environmental and ecological CENS applications. Seismic sensor installation in Peru (photo taken in 2008). Because the environmental applications did not have an extensive history of sensor-based data collection and early CENS technologies were neither reliable nor sturdy enough to run autonomously, the early sensor systems for environmental research had to be run manually. During our 2006 interviews, more than one scientist from the environmental science and biology teams noted how they were just reaching the point of being able to use CENS technologies in field settings, as illustrated by the following quote. The marine application, or the aquatic application, started more slowly. The seismic application already had things wired. They have a huge array of things. We knew when we started doing this that wireless embedded networks in aquatic systems would take more effort, and we started kind of with laboratory-based work, and we’ve moved now kind of rapidly into the field. We are, I would say, at the point now where we have a functional network. And we are just at the point where we are now able to lay all of these biological measurements on top of that. 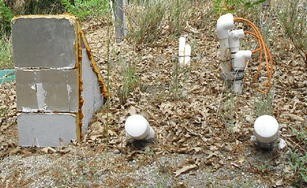 A good example of an ecological static sensor deployment was a soil sensing system deployed in southern California. The system had two main components. The first was a camera system that imaged root and fungal growth in the soil, through the use of transparent tubes installed in the ground. Researchers dug holes and buried tubes in fifteen locations along a 100 m transect. After waiting 6 months for the soil to settle around the tubes, CENS researchers collected data by inserting a camera into each tube to take a series of images of the surrounding soil. Researchers analyzed these images for instances of root and fungal activity. The soil imaging tubes were installed in 2005, and researchers visited the site on a weekly or bi-weekly basis at least through 2011. Second, beside each imaging tube, CENS researchers buried a set of sensors that capture soil moisture, soil temperature, and carbon dioxide (CO2) readings at three depths below ground. These sensors provided environmental parameters with which CENS ecologists could correlate the growth of root structures as identified via the images. Figure 2 shows an image taken in 2010 of a field installation for the CENS soil ecology project. The cables emerging from the three pipes on the top right of the image are attached to the underground temperature and moisture sensors. The two capped tubes at bottom right are used for taking soil images manually. The large triangle at left is insulation covering another tube used for an automated soil imaging system. This automated image capture system was installed in 2010. Soil ecology field installation (photo taken in 2010). The seismic and soil deployments illustrate both the benefits and the limitations of static sensing technologies. The first benefit of static sensing systems is that they allow researchers to take data at temporal and spatial scales that were previously very difficult or impossible to achieve. In the case of the soil project, the camera video imaging system enables researchers to measure phenomena of microscopic size more densely than any manual sampling or observing technique would allow, while the sensors provide information about the soil environment in situ. In the case of the seismic network, sensors can collect data simultaneously at 50 or so locations with higher temporal resolution (such as 10–100 samples per second) and over longer time periods (2 years or more) than a human investigator or team could achieve manually. This steady streaming of data is the second benefit of static sensing systems. With steady streams of data, CENS researchers are able to perform nuanced analyses of a variety of ecological and environmental phenomena, including daily cycles (e.g., cold air drainage in mountain passes), event behavior (e.g., root activity during and after rain events), and sustained behavior (e.g., bird nesting processes) than was possible with data collected using sparse point sampling techniques. Outside of the seismic and soil sensor deployments, however, the limitations of static sensing systems were as salient as the benefits to scientists who made use of them. Static sensing systems proved to be difficult to deploy for scientific uses due to: 1) the large infrastructure investment required, 2) the physical inflexibility of these systems, 3) the inability to measure biological parameters of interest, and 4) technological difficulties encountered in scaling sensor arrays. Static systems had heavy infrastructure requirements to ensure reliability and security over time. Long-term static sensor deployments required stable power infrastructure and physical structures that were robust enough to withstand unforeseen environmental factors such as plant growth, destruction caused by animals (domesticated and wild), and weather conditions that are unexpectedly wet, dry, hot, or cold. The installation process itself often involved substantial amounts of time and human effort. In the soil sensing static deployment, the installation process involved digging holes for sensors, camera tubes, and sensor housing and stabilization structures, as well as running power lines approximately 50 yards through the forest from a nearby building. Researchers then had to wait up to 6 months for the soil to settle before any useful data could be taken. We observed deployments where researchers installed elaborate battery/solar power systems when no existing power infrastructure was nearby. Fieldwork also could involve digging holes to install solar panels (or the poles on which they sit) or to bury batteries and their protective containers. Static systems required researchers to visit research sites often to monitor the system and to perform maintenance. On deployments that required manual data collection, trips to deployment sites occurred regularly. In addition to collecting data, researchers checked to make sure the deployment site and the sensing system were in proper order. In other projects where deployment equipment was controlled and run remotely, maintenance trips typically took place only when problems occurred. In those instances, researchers made trips to the deployment site specifically to perform maintenance, such as fixing malfunctioning or defunct parts, calibrating sensors, debugging software, checking batteries or other power systems, and installing new equipment. Because of the infrastructure requirements involved in their deployment, static sensing systems were largely inflexible in how they could be used. Once installed, static sensing systems were very difficult to move. 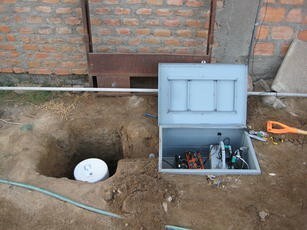 In the case of the seismic and soil sensor deployments, moving the systems required digging up sensors, installation fixtures, and power infrastructures, digging new holes, and performing a complete re-installation. Ecological and environmental researchers, however, regularly need to adjust their research activities to unpredictable situations and events. With static sensing systems, a scientist has the flexibility to adjust the data-sampling rate, but further adjustments required serious effort. CENS biologists and ecologists were interested in characterizing living organisms and the ways that they interacted with their environments. Most field-ready sensors, however, could not detect or measure biological parameters. Sensors were good at detecting and measuring physical parameters such as temperature, ground motion, salinity, pH, and humidity. These sensors were based on well understood physical and chemical properties, had established calibration methods, and could be purchased off the shelf. Physical parameters provide useful background information about field settings, but did not help scientists to study the more nuanced biological phenomena of interest. Sensors that directly measure biological activity do not yet exist. To investigate biological phenomena, CENS scientists often collected physical samples such as water and soil samples for later laboratory analysis, or used sensors to detect indicators of biologic activity, such as using fluorescence as an indicator of the presence of chlorophyll in sea water, or camera systems that captured biological activity visually. The vision of smart dust included the ability to deploy hundreds or even thousands of small sensors in an environment. Considerable effort was devoted to developing low power sensor and data transmission equipment that could be deployed in field settings, as the aforementioned statement illustrated, that “about 90 % of the papers produced in the first 3 years of CENS were about battery life.” Wireless data transmission systems also scale poorly to larger sensor networks. A number of CENS research projects focused on developing more efficient wireless data routing protocols, but scaling sensor networks beyond 10–20 nodes proved to be a significant technical challenge. Sensor deployment methods were thus a particularly problematic boundary object. The promise of sensor networks is to serve as principal components of cutting-edge scientific research methods. The four characteristics of the static sensing systems outlined above collectively limited the scope of research that ecological and environmental scientists in CENS could pursue with these new technologies. I think CENS wants to put forward an idea of a sensor network as something different than what a lot of people think of it as. There’s this sort of prevailing smart dust kind of vision that I think CENS is trying to get away from. If you look at the projects now, they’re rapid deployment, they’re lots of human interacting with data, lots of robotics. It’s a much richer set of observation tools. The dust thing gets you into one set of questions and this thing gets you into a whole set of other, the primary difference being here there’s a human and here there’s not. So I think recognizing that you have to have a human around is important. Human expertise is a valuable resource in scientific research, and CENS’ shift to human-in-the-loop sensing was an explicit recognition of the need to make use of those resources. As noted above, the introduction of statisticians into CENS was itself a catalyst for aligning language and research approaches by emphasizing more dynamic and interactive modes of sensing. [The senior electrical engineer] always says that it’s because I’m pushing in this direction or that that they keep advancing. … if you’re working with someone who is making the box then you don’t have to accept how the box functions, right? You can question every part of the box. I’ve been trying to get our stats students to do more of this. They tend to be consumers of data and not participants in a larger data collection or data analysis endeavor or a science endeavor, however you want to call it. So the first part is always that tension of what can you measure and what does it say and whatever. … It’s like what are the characteristics? Then how do you want to interact with it? How do you want to interact with it in the field because … once you’ve got it set up you inevitably want to tweak it and play with it while you’re there. So how do you enable that? … I don’t want to have to run back or set up an experiment for a weekend and then look at it. The dynamic sensing systems developed in CENS differed from static systems in three key ways: 1) they were deployed over shorter time periods and were less dependent on stable infrastructure, 2) they utilized sensor mobility as a key research tool, and 3) the systems were designed to allow the researchers to configure and adjust their sensing strategies in the field. As the limitations of long-term static deployments became visible, CENS collaborations began focusing on shorter-term deployments, often called “campaigns.” Campaigns were typically between 3 and 7 days, where sensing systems were taken to the location of interest and installed temporarily. At the end of the deployment, all of the equipment was disassembled and removed from the location. Campaign deployments enabled CENS researchers to reap the benefits of sensing technologies without the infrastructural costs of permanent sensor and power installations. For example, one particular CENS robotic technology went through a number of development stages, at each stage becoming easier to install, less dependent on heavy machinery, and more mobile. The first version of the system, created in late 2003, was very labor intensive to install in the field, had only one dimension of motion in which sensors could be moved (left and right), and was considered to be “semi-permanent” in that it was installed and left in one location. The second version, created in 2005, was built to enable “rapid deployment.” It could be installed in a few hours, allowed two dimensions of sensor motion (left/right and up/down), and was intended for use during short-term campaign deployments. Later versions, produced in 2007 and 2008, allowed three dimensions of sensor motion and required even less installation time. The flexibility of dynamic sensing systems allowed researchers to make more efficient use of sensing systems. Researchers designed sensors to have mobile capabilities. Sensor mobility allowed CENS researchers to study phenomena that changed or moved in time and space, and to sample at multiple locations with fewer numbers of physical sensors. The following quote illustrates how mobility was a key research question for the technologists, but also was a significant benefit to the science teams. So the research questions in the embedded computing space, and an actuated sensing space, are focused on optimization, that is how to develop the proper optimization for the most effective sensing, where the most effective sensing is defined by application needs. And applications that we’ve been exploring range from cross terrestrial ecosystems, aquatic ecosystems and contamination system studies to applications in biomedical, and even some applications now in instructional technology ….So in the case of networked sensing, the new part is actuation, the ability to precisely move and relocate a sensor to optimize sensing performance, or circumvent obstacles to sensing, or simply to acquire data at such a high resolution density that the challenges associated with either planning deployment or selecting deployment are lifted. Some researchers in CENS use a combination of campaign-style dynamic sensing system deployments and long-term static sensing system deployments in order to take advantage of each. In these hybrid deployments, researchers installed static sensors to collect data continuously while campaign style deployments were performed adjacent to, or in conjunction with, the existing long-term static deployments. For example, CENS researchers used a combination of fixed and mobile sensors for sensing and sampling microbial communities in aquatic ecosystems. Stationary buoys provided baseline physical data in the deployment locations and identified interesting features of the aquatic environment. The CENS team then used a mobile robotic boat to perform high-resolution spatial sampling around the areas identified by the static buoys to be of highest interest. The question I want to look at is new, only because I want to take advantage of the fact that there’s a human that can interact with these networks. And so my research question is looking at how do you increase users’ confidence in a system by suggesting actions that a user can take? So for example, because we were in the field, if a system could say this data looks bizarre, instead of just throwing it away, say it looks bizarre in this way, so why don’t you take a manual sample so that you can sort of have third-party validation? Or why don’t you disconnect the sensor and test it connected to another sampling machine because I suspect the hardware? The scientific benefits of having more interaction with sensor technologies and data while in the field were similar to the benefits noted above in regards to sensor mobility: researchers could identify data features of interest while in the field, and adjust sensor technologies to target their investigations as desired. The three features of dynamic sensing can be seen in detail in a week-long deployment that took place in the summer of 2007, in which two of the authors of this paper attended as participant observers. The deployment involved nine researchers (in addition to ourselves), split between environmental scientists and computer science/engineers, and took place near a river. Prior to the deployment, a couple members of the environmental science team scouted the field site and picked out locations where the sensors were to be installed. This scouting was necessary because the previous time the team visited this river it had been flooded, and as a result the river beds had changed. The scouting trip allowed the environmental science team to develop a general plan of what they wanted to accomplish during the deployment. They also cleared vegetation and other obstacles that might affect equipment installations. At the beginning of the deployment, both teams walked through the field site to orient themselves on how the installation would take place. Once it began, everybody helped on the initial equipment setup. The equipment being used was the “rapid deployment” version of the robotic technology discussed above. The technology installation took about 3 hours. Some installation steps could take place concurrently, so a number of small groups of two or three people split off to work on individual tasks. The equipment installation process encompassed many small specific tasks and experiential knowledge. Many installation steps used mundane materials and were semi-improvised, such as using cable ties, duct tape, and plastic wrap to attach and secure sensors. Figure 3 shows members of the scientific and technical team at an installation site. Deployment of a dynamic sensing system (photo taken in 2007). 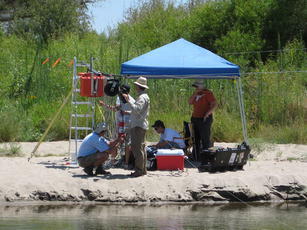 Once the equipment was set up, the researchers moved the robotic platform (with sensors attached) out into the river, and took initial sensor readings. After this data collection, the lead scientists and a computer scientist used the initial readings as a baseline of data during a short discussion about how to maximize the sampling yield without spending too much sampling time on any one area. They made decisions about sampling rates and dwell times (how long the sensor would be left in one location before being moved) based on what was seen in the initial data, which the computer scientists then programmed into the system. The robotic system was then launched and allowed to move and collect samples autonomously, although a member of the technical team was always close by to ensure smooth operation. This process was repeated a number of times throughout the six-day deployment. Following each data collection run (which were programmed to take between 1 and 2 hours to complete in order to maximize the use of the systems), the researchers would plot the data using custom software algorithms developed by the computer science team. Looking at the data immediately after they were collected, the scientists and technologists together made decisions about when to adjust system parameters (sampling rates, dwell times, and locations) that were based on the conditions present at the time, as well as decisions about when to move the entire equipment setup to a different location on the river. Over the course of the week, the team moved the system to four different river locations, and conducted roughly thirty data collection runs using various configurations of sensors. During the deployment, the needs of the environmental science team were the focus of both the science and technology researchers. The technologists, however, had their own agenda in addition to helping the scientists run the sensing systems. After the deployment equipment was running smoothly, members of the technology team began performing their own unrelated experiments on their next generation robotic system. The next generation system was not ready for scientists to use, but this trip provided the technical researchers with an opportunity to perform proof-of-concept tests on the new technologies in a field setting. As these cases illustrate, researchers are not without challenges in both installing and using dynamic sensing systems. In fact, dynamic sensing systems might have greater power requirements and necessitate more maintenance in the short term than static sensing systems due to the moving parts and machinery of mobile robotics. Researchers sidestep these power problems by using portable batteries and short-term campaign deployments, allowing them to retain a much higher degree of flexibility and adaptability. The human-in-the-loop emphasis enabled scientists and technology developers to produce research results at an increasing pace. The productivity of CENS collaborations, as measured by the number of papers published, increased substantially over the period from 2002 to 2007 (Pepe and Rodriguez 2010). Sustaining collaborations, however, proved to be as difficult as building them. In several CENS collaborations, scientists struggled to use CENS technologies after the principal development efforts were complete. In one ecology project, technologists set up a wireless data transmission system in 2007 to transmit data from the field site to a central database. By 2010, fewer than half of the wireless stations were still transmitting data correctly. As an ecology technician noted, the students who set the system up did not have time to fix the stations. Because the network was minimally functional, the technician was visiting the field site every 6 weeks to download the sensor data manually, and was not uploading his data to the central database. Similarly, a computer science student worked with biologists to develop an automated method for sending data from sensors in the field to a project database using a wireless data transmission system. This system would allow researchers to visualize data shortly after they were collected, potentially allowing the biologists to see when interesting events were occurring, and allowing technologists to identify any equipment problems faster. An initial version of the system was developed, but shortly thereafter, the computer scientist student left CENS for about a year to work in another oceanographic research center. During his absence, the wireless data transmission system and associated database fell into disrepair and were not used by the biologists. Because the new technology was never fully adopted before he left, the established field practices of the biologists, including manually downloading the data, did not change. As the computer science student stated, his absence interrupted the process of building practices around the new system. I think the main problem is I am [gone], so I have been physically unable to maintain this thing as I would want to. …[W]e weren’t able to hit the level of reliability we would want, when [the biologists] can trust the data [in the database]. So they always went and downloaded data anyway. When I was in [the field, my computer science partner] was really great. She taught me a lot of the commands, and so there was stuff that I was able to do on my own. But it’s good to have someone who is knowledgeable there, because we had days where you would send the command and for some reason things would crash or something, and she was really good about being able to retrieve data and we didn’t lose very much data at all. But there were definitely issues that I couldn’t have addressed just given my limited knowledge. By 2010, this environmental science student had graduated. Subsequent members of her science lab did not have the benefit of working on a day-to-day basis with computer science partners. As a result, by 2010 the lab had largely stopped using CENS sensing technology during field data collection work, with one student stating that they were not using sensors much at all anymore within their lab. In some areas of ecology a lot of technical training has occurred. It’s mostly been informal. … I do think that ecologists need to get a better background in some basic engineering, which I never had. We’ve had statistics, and statistics has changed a lot, but still there’s a focus in ecology on one type of statistics; for example, multi-variant to analyzing communities. But how do you handle sensor type of data? … As far as I know, there’s no statistics course that trains students to go in that direction. You kind of have to figure that out on your own. And so I think we need new ways to think in terms of analytical tools in engineering, designing, maintenance. I think, until that becomes a majority of students it’s probably not really going to happen. As long as scientists are reliant on technologists to be present to run, monitor, and maintain technologies, a collaboration must continue indefinitely if the technologies are to be used on an ongoing basis. Some scientific teams were, however, able to continue using CENS technologies after the main technology development periods were finished. In these cases, the sustainability and usability of technologies were linked to the institutional settings in which the scientists and technology partners were embedded. CENS’ seismic project was an initial collaborative nexus, but after the main technology development team moved on to new projects (through graduations, changing interests, and funding shifts), the use of the CENS technologies by seismologists plateaued. As of this writing, CENS wireless technologies continued to be used for one segment of a four-part sensor deployment, along with a web interface created by a member of the CENS technical team that provided status updates in near real-time on the wirelessly connected seismic stations. This tool allowed the seismic field team to identify problems quickly as they occur in the field and was recognized by the technical staff to considerably increase the resiliency of the portion of their sensor network that utilized CENS wireless transmission tools. The scientific members of the seismic collaboration did not understand or use all of the capabilities of the new tool, but recognized its importance to the technical team, and used it on occasion to check for problems in the seismic sensor network. In another example, the CENS aquatic team merged the science and technology labs under a new name as CENS came to a close in 2012. Some early CENS work in developing networked marine sensors slowed down, as scientists developed their own practices that did not require the use of the networking technology, but another initiative to use mobile sensors to monitor and rapidly respond to marine biological events gained momentum in the latter part of CENS’ existence. The new lab created collaborations to study and deploy mobile sensors. The CENS ecology projects continued collaborating to varying degrees. As noted in the previous section, a wired sensor data collection system for a forest environment was never proven to be field-resilient and was thus largely abandoned by both the science and technology partners. As of 2012, however, a soil camera system is being developed by an independent company spun off by CENS technical staff. Technical work to develop image processing systems for soil images never went beyond the prototype phase because of the difficulty of the visual processing task. Even after the CENS work in that direction stopped, CENS ecologists continued to mention how an automated visual processing system would be a potentially transformative tool for their research. Moving from static to dynamic sensing involved a process of unearthing the infrastructure, both conceptually and, in some cases, literally. By pulling the sensors out of the ground (or wherever their static installations were located) and providing ways to move them through the environment, CENS research shifted from static to dynamic infrastructure development. We contrast our characterization of CENS researchers as unearthing their infrastructure with Bowker’s (1994) notion of “infrastructural inversion.” Infrastructural inversion is a methodological move that involves examining the infrastructural changes that preceded or accompanied a particular claim. CENS researchers adjusted their views about the components and configurations of their sensor technologies because of the difficulties encountered in reliably deploying static sensor networks. It would be a stretch, however, to say that CENS researchers themselves performed an infrastructural inversion because the changes in assumptions and technologies that occurred in CENS were the result of years of iterative technology development, testing, and refinement with particular scientific research questions as goals. It is certainly true that CENS technology development, both the processes and the products, changed significantly over the life of the Center. If infrastructural inversion does not encapsulate that change, another concept, or set of concepts is required. A number of salient points emerge from our ethnographic descriptions. Human requirements and expertise became very visible to the collaborations, and became central to the organization and development of CENS’ collaborative projects. CENS researchers acted on changes of their assumptions by changing what they were building, with whom they collaborated, how they performed sensor deployments, and how they talked about their research. Most CENS collaborations did not break down when their initial technologies did not prove to be very useful to scientific partners. Instead, they shifted technical development efforts in the direction of more interactive, mobile, and scientifically participatory infrastructures. Our findings illustrate how boundary object and trading zone concepts are related. First, the characteristics of boundary objects have a profound influence on the configuration of collaborations. At the beginning of CENS, ubiquitous and large-scale sensor networks were the primary research goal. The initial products of technology research, however, were often unreliable and mis-aligned with their target users. As the research focus changed, so did the organization of the collaborations. Sensor data emerged early on as a boundary object that was understood differently by science and technology partners (Borgman et al. 2007; Borgman et al. 2012). Research methods for sensor deployments and statistical analysis emerged later as objects that lay on the boundary between collaborators. Methods for deploying sensors in field settings were themselves boundary objects within CENS. The ways that new technologies are used at first tend to mimic the ways that old technologies were used. With seismic sensing as the model, static deployment methods were initially seen as the canonical research method when using sensor networks. Dynamic sensor deployment campaigns, however, were more consistent with ecological field practices than static sensor deployments, because they were more adaptive to field conditions. Ecological and environmental researchers need to adapt to unpredictable field settings. Static sensing systems were not very adaptable due to the heavy installation and infrastructure costs. By developing dynamic sensing systems with greater mobility and ease of deployment, CENS researchers sought adaptability. Scientists could finalize the precise positioning of equipment in the field, based on current conditions (e.g., moisture, temperature, light, shade). Scientists also could alter the position of their sensors and the frequency of sampling while in the field. For example, if the water depth chosen was not yielding interesting data, sensors could be raised, lowered, or moved. Dynamic deployments also were more consistent with computer science and engineering practice, as equipment could be tested sooner and more iteratively than with autonomous networks. Iterative testing and development is common practice in computer science and engineering research. Campaign deployment methods, as a set of work arrangements that were both material and processual (Star 2010), allowed new technology to be tested in real world situations. Technical researchers wanted to assess the successes and problems encountered in a real-world setting, whereas scientists wanted to collect data that were useful to a scientific research question. Sophisticated but delicate prototype equipment required different deployment configurations than long-term static research infrastructures did. Short-term campaign style deployments allowed researchers to deploy newly developed systems in real-world field settings without the need for field-hardened protocols, installation infrastructures, or heavy-duty investment in security. Researchers were almost always on site while the new equipment was being used in campaign deployments, and were thus able to oversee delicate and, in some cases, expensive equipment. Short-term deployment campaigns enabled researchers to deploy equipment that was too delicate, too expensive, too premature, or had too short a life span to leave unattended in the field. Some chemical sensors, for example, were sufficiently volatile that they lost sensitivity within a few days. In contrast, the autonomous static sensor deployments that were created for particular CENS teams, such as the seismic and soil sensing teams, required substantial investment in monitoring and maintenance activities. As part of a new research thrust, CENS brought in statisticians to help with data analysis around 2005. Statisticians brought in methods for visualizing and triangulating data from multiple sources in real time. The statisticians were not invested in either the scientific or the engineering part of the collaboration, and were thus able to help CENS teams focus on solving data analysis problems on both sides. Statisticians pushed for more interaction with the data as they were being collected, providing strong impetus for the human-in-the-loop notion. Statisticians also proved to be boundary spanners. Students in CENS created a working group, named the “data integrity group,” devoted to using statistical techniques to characterize sensor problems that were manifested as faulty data. Members of the integrity group were from electrical engineering, computer science, and statistics, and cross-cut multiple CENS projects. Statisticians created new trading zones by closely examining sensor data and by introducing notions that were new to CENS collaborations, such as calculation, calibration, validation, and data integrity. As the statisticians’ role illustrates, reconfiguring boundary objects can shift the characteristics of the trading zones. Science and technology collaborators initially received uneven benefits from CENS collaborations, which was manifested as difficulty finding mutually interesting problems. In this sense, CENS initially exhibited characteristics of what Collins et al. (2007) term a “subversive” trading zone. The needs and concepts of one group dominated the other. As the collaborations matured and dynamic deployments became the central research method, static sensing systems provided very interesting computer science and engineering problems, such as developing low power hardware and creating efficient network communication protocols, but were less useful for environmental scientists. Academic computer science and engineering researchers also had minimal interest in developing the hardened field-ready technologies that scientists require for repeated and sustained field use, as they were interested in pursuing cutting edge and experimental systems. The collaborative nature of the research in CENS required that the scientists and technology developers found, in the terms of one researcher, the “collaborative sweet spot.” Science and technology collaborators needed mutual benefits from deployments by concurrently testing, evaluating, and adjusting their equipment in the field while gathering scientific data. In developing the campaign deployment model, CENS collaborations took on the characteristics of what Collins et al. (2007) call “fractionated” trading zones, because the collaborations were organized around particular boundary objects (namely sensor technologies, data, and research methods), with interactional expertise being central to the collaboration. Campaign-style deployment of dynamic sensing systems allowed the technology researchers to perform iterative development of cutting edge sensing systems, while still providing ecological and environmental scientists with advanced tools capable of forwarding their own research agendas. Particular bridging individuals facilitated the interactional expertise necessary to bring concepts, methods, and tools from one side to the other, and out into the field. By collaborating in the field, researchers and students learn about one another’s problems and needs very quickly. Bringing computer science research into contact with real world problems is a primary legacy of CENS. In writing a collaborative paper with CENS technical researchers in 2007, we discovered that CENS administration had soured on the phrase “embedded networked sensing” as a description of the technologies being developed within CENS because it did not accurately reflect the kinds of systems being developed. Instead, CENS leadership was recommending that researchers use the phrase “wireless sensing system” to describe their newly developed technologies. What were initially “sensor networks” became “wireless sensing systems” as the sensor infrastructures became flexible, mobile, and adaptable. This terminology indicates that from the perspective of CENS, sensing infrastructures no longer need to be defined as technologies that run autonomously and are “embedded” in the environment of study. Sensing infrastructures can instead be defined as systems that provide scientists with the ability to adjust sensor locations, parameters, and the sensors themselves in an interactive and dynamic fashion. CENS also redefined sensing systems as having humans in the loop, featuring human-sensor interactions that enabled field scientists to adjust their field work to the field situations that they encountered. In addition, the terminology of sensor deployment “campaigns” allowed CENS to emphasize the importance and utility of short-term field excursions and temporary sensor installations, which also differed from the initial vision of embedded and ubiquitous devices with lengthy lifetimes. The success of new technologies in any domain hinges on the degree to which they become embedded within the work and research practices of that domain. Static sensors were meant to be transparent, but the static sensor infrastructures developed by CENS were all too visible to the scientists using them for environmental and ecological research. The sensing systems were unearthed through the explicit reintroduction of human skill and expertise into the data collection process. Collaborative languages developed as CENS’ focus changed from an emphasis on building autonomous sensing systems to systems that addressed human needs. Boundary objects and trading zones are central to the way that CENS research evolved. The initial focus of CENS – embedded networked sensors – anchored a trading zone of static, autonomous, and ubiquitous technology. Neither this initial boundary object nor the initial trading zone were stable, due in part to the mutual influence of boundary objects and trading zones. The static sensing model was based on researchers’ understanding of sensor technologies as they existed prior to CENS opening, and was based in particular on seismological sensing field methods. Generalizing from seismology to the other science applications revealed another boundary object, namely the data being generated by the sensors. Static sensor deployments are very effective at generating stable sets of physical measurements, such as temperature, wind speed and direction, and ground motion. These physical data are only part of the story for biological and environmental science research, as biological and chemical data also are necessary to characterize many phenomena of interest. The differences between the ways that physical data and biochemical data can be used reveal the importance of initial use cases for technology development. The static sensing model produced a particular collaborative trading zone, which resulted in many stalled conversations and in building technologies that were of limited use. Subsequent boundary objects arose in the form of sensor data and of research methods. Dynamic sensing models, with their corresponding campaign-style sensor deployments, better suited most science and technology partners, resulting in a trading zone that was more productive, especially for life science applications. Later, in dynamic sensing deployments, statistical methods became a boundary object within a new trading zone, which in turn arose through the contributions of new collaborators with statistical expertise. Together, dynamic sensing systems and advanced statistical tools allowed the scientists to have richer involvement with their data collection processes. With dynamic sensing systems, the scientists were able to adjust the data sampling rate, the physical location of the sensors, and the paths by which sensors moved through the environment. As the technology progressed, scientists were able to use statistical visualizations to examine their data soon after they were collected, and could make adjustments to their fieldwork based on what they saw in those data. Through the use of adaptable and mobile sensing systems and campaign deployments, the scientists had more flexibility in where, when, and how they could conduct their field research. In addition, the technology teams could rapidly iterate on hardware and software designs, which was their preferred development method. In the dynamic sensing model, the sensing systems became embedded not in the environment of study, but in the practices of the scientists. Technology-driven science manifests very differently within different research communities. What works for seismological research, with its focus on physical parameters and lengthy deployments, does not necessarily work for research that focuses on rapidly changing biochemical phenomena. The reality of these differences reinforces the value of flexibility and adaptability within collaborative work. CENS researchers changed their research methods, products, and languages through their own collaborative process. The changes happened from within, rather than being dictated from outside of the Center, and were responsive to the way that the collaborations were working. The analysis presented in this paper points to a number of considerations for future research. With technology-driven and data-driven science pervading most research domains, collaborations between scientists and technology researchers, like the CENS exemplar, will become more common. What factors lead to the institutionalization of such collaborations? As noted above, some CENS collaborations did become institutionalized, for example through the creation of new interdisciplinary labs, but not all did. Understanding how technology and data-driven collaborations function within research institutions may influence organizational policy. Second, sensor data were an important boundary object within CENS, but CENS had a finite funding timeline. What will happen to the numerous data sets collected by CENS science and technology researchers now that the core funding has ceased? Will the data receive long-term curation without explicit funding from the NSF for that purpose? Our ongoing research of CENS’ collaborations is investigating these questions. Finally, CENS supported the development of many technologies and the education of many students. How will these technologies be adopted and adapted in the short term, and how will those technologies evolve over time? Similarly, how will CENS students carry on as researchers and educators themselves in the future? How will their interdisciplinary education affect their career and research directions? Such questions seek to assess the impact of investments in interdisciplinary collaborative research. Research reported here is supported in part by grants from the National Science Foundation (NSF): (1) The Center for Embedded Networked Sensing (CENS) is funded by NSF Cooperative Agreement #CCR-0120778, Deborah L. Estrin, UCLA, Principal Investigator; (2) CENS Education Infrastructure (CENSEI), under which much of this research was conducted, is funded by National Science Foundation grant #ESI-0352572, William A. Sandoval, Principal Investigator and Christine L. Borgman, co-Principal Investigator. (3) Towards a Virtual Organization for Data Cyberinfrastructure, #OCI-0750529, C.L. Borgman, UCLA, PI; G. Bowker, Santa Clara University, Co-PI; Thomas Finholt, University ofMichigan, Co-PI; (4) Monitoring, Modeling & Memory: Dynamics of Data and Knowledge in Scientific Cyberinfrastructures: #0827322, P.N. Edwards, UM, PI; Co-PIs C.L. Borgman, UCLA; G. Bowker, SCU; T. Finholt, UM; S. Jackson, UM; D. Ribes, Georgetown; S.L. Star, SCU. We also are grateful to Microsoft Technical Computing and External Research for gifts in support of this research program. The authors would also like to thank David Fearon, George Mood, Alberto Pepe, Katie Shilton, Elizabeth Rolando, and Laura Wynholds for their thoughtful comments on prior drafts of this paper.